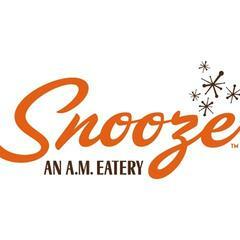 Founded by brothers Jon and Adam Schlegel, Snooze was born on April 2, 2006 in Denver, Colorado seeking to evolve the A.M. dining experience through culinary innovation, an eclectic and energetic atmosphere and comfortable and friendly service.<br><br>Breakfast marks the beginning of a new day. At Snooze, we believe life is for living and each person and each day is worth celebrating. Our mantra: it only takes a moment to make a difference.<br><br>From the day we were born, our people – Snoozers – have led the way serving creative twists on America’s favorite breakfast classics in a casual, friendly and vibrant atmosphere. The passion of our Snoozers is contagious. Over the past 8+ years, it has inspired Snooze fans of all ages across the country.<br><br>We embrace our roots in the Denver Ballpark neighborhood and aspire to be an integral part of every community in which we’re lucky to live. Today, you can experience Snooze across neighborhoods in Colorado, California, Arizona and Texas.<br><br>We invite you to join us, make up a new pancake and dance to the music.<br><br>Wake up to the potential of your day. Wake up to Snooze!